Kenny J: For me, some of the tie-ins to Marvel’s Secret Wars have seemed fun but superfluous. Not meant to last beyond this summer or the end of the event, whichever one comes first. 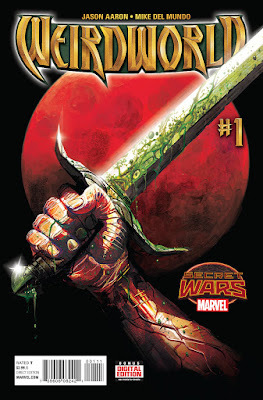 However, there are smatterings of titles that may continue post-Battleworld, one contender being Weirdworld, an amalgamation of '70s movie tropes rendered by Mike del Mundo and written by Jason Aaron. 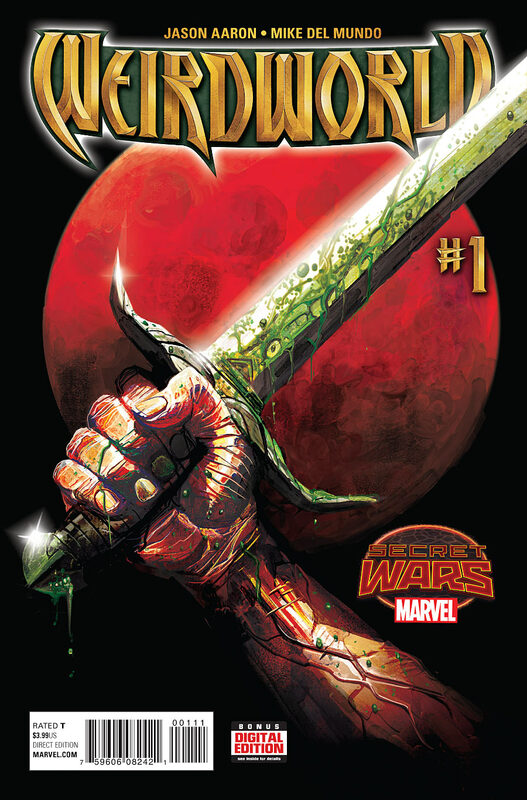 The fantasy realms and apocalyptic wastelands of Weirdworld are in experienced hands as the latter creator’s recent run on Thor proves he has an aptitude for the mythological. Although I am generally not a fan of fantasy as a genre, this is something I want to be on board for from the beginning, even if it does go no further than October. Speaking of myths and beginnings, from the get go of his new Image book, Injection, Warren Ellis has begun spinning a tale of secret societies, magic and futurism. Where it will go is anybodies guess at this point in time but the initial issue was so packed full of atmosphere and intrigue that I will definitely be picking up the second one come this Wednesday. Once again it is a smallish week packed full of comics I’m really looking forward to including Batman #41 as it begins a new arc with a brand new Batman. With Bruce Wayne disappeared - apparently dead - it has fallen to Jim Gordon to take up the cowl, albeit a metallic one. Scott Snyder and Greg Capullo’s run is the only book I have consistently been buying since DC's New 52 launched. I'm hoping this remains the case post Convergence. Tom P: Black Science #15 roars of the line first this week in typical frantic style. I love it's dimension-hopping antics, all grounded by a workaholic father wracked with guilt. It's also time for the final issue of Chrononauts. To be honest, I've found the story to be hollow and the main characters utterly unsympathetic and repellent, but I can't ignore Murphy's artwork and it has been a good excuse for him to draw some fun scenes. I'm sure his next collaboration with Rick Remender will produce something with more bite. The ever dependable interstellar Saga will have no such issues as the potent mix of science fiction and soap opera shows no signs of entropy. I've always had a soft spot for 1602, Neil Gaiman's take on the Marvel Universe, which imagined if it's characters had existed in 16th century England. 1602: Witch Hunter Angela #1 should be a welcome return to that world thanks to the epic Secret Wars. Now that's what I call an event! That just leaves the latest must have hardcover omnibus form Dark Horse collecting BPRD: 1946 – 1948. In the wake of World War II, Professor Trevor Bruttenholm - occult investigator and guardian of the young Hellboy - and a group of war-weary veterans investigate Hitler’s top-secret Project Vampir Sturm, exposing one of the greatest villains of the Third Reich, uncovering the secret history of vampires, and leading one Bureau agent to risk his soul and his mind. All for a value price. Can't pass that up!